Action/Adventure/Drama/Sci-Fi/Thriller/Gainful, USA, 2015, 137 min. Synopsis In the opening scene, Katniss Everdeen (Jennifer Lawrence) is getting vocal therapy after being nearly choked to death by Peeta Mellark (Josh Hutcherson) in the previous film. Once she can properly speak, she witnesses her younger sister Primrose "Prim" Everdeen (Willow Shields) entering the closed off cell where Peeta is. Peeta eventually freaks out from the Capitol programming and tells Prim to kill Katniss, as she caused everything.Katniss ends up going to District Two. On the way, she kisses Gale (Liam Hemsworth), but she "gave the kiss of a drunk person". She jokes that with Peeta in 13, he doesn't have to be jealous anymore.Once in District Two, Commander Paylor (Patina Miller) mentions how the Rebellion failed to capture the arsenal from The Nut, a huge mountain containing Capitol infantry. Gale suggests that they use the special bombs that he and Beetee designed to blow up the Nut and take over of it from the inside.When the hovercrafts go, Katniss says that its horrible as lives will be lost. Gale tells Katniss that this is war. Katniss is then rushed to shoot a propaganda speech, and then the captured refugees arrive by train. The rebellion is noticeably horrible to the refugees by threatening them and shooting them. Katniss stops her speech and screams at everyone to stop.... and then a refugee holds her hostage. He tells Katniss, "Give me a reason why I shouldn't shoot". Katniss replies that she can't and pleads about her being tired about everything and that her murder would actually be a favor. The refugee lets her go and Katniss begins an anti-President Snow speech only to be shot. Chaos ensues.In the Capitol, President Snow (Donald Sutherland) celebrates with his delegates with a toast. One of his delegates, Antonius (Robert Knepper), is asked by Snow to what they are celebrating. He says that it's Katniss failing. Snow disagrees and tells him that they are celebrating an ending of an era. Antonius then drops dead having been poisoned.Katniss wakes up from her injuries and sees a bald morphine-taking Johanna Mason (Jena Malone). Johanna is mad at Katniss and blames her for everything.Next, Peeta is being visited by Katniss. Peeta blames Katniss for everything as well, going as far to say that if he never gave her the piece of bread, they would never have ended up in that state.Katniss is visibly upset and goes to President Coin (Julianne Moore). Katniss wants to go to the Capitol and fight, but Plutarch Heavensbee (Phillip Seymour Hoffman) and Coin tell her not to and to simply stay and shoot promos.Katniss then attends the wedding of Finnick (Sam Clafin) and Annie (Stef Dawson). At the reception, everyone is happy and dancing except Katniss. Johanna finds her sulking and when Katniss promises to kill Snow, she gives her a plan: Sneak on a medical supply hovercraft at midnight. Katniss then goes off to dance with her sister Prim, hugging her before doing her plan.When she lands, she finds Gale and has the support of onlookers everywhere. Commander Paylor then makes a speech. Katniss is then integrated in Squad 451. Squad 451's goal would be to escape pods, deadly weapons of traps similar to the games created by the Capitol, and make their way to Snows mansion and capture the Capitol. The squad includes Katniss, Gale, Finnick, Homes (Omid Abtahi), Lt. Jackson (Michelle Forbes), Mitchell (Joe Chrest), the twins Leeg 1 and 2 (Misty and Kim Ormiston), Boggs (Mahershala Ali), Cresida (Natalie Dormer), Pollux (Elden Henson), Messala (Evan Ross) and Castor (Wes Chatham). Boggs is also given a Holo, a device which will help detect pods. The Holo can also act as a bomb if the word "Nightlock" is repeated three times (important later).The squad assembles and finds the first pod. 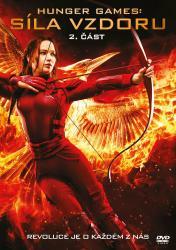 Katniss fires an arrow to test for the pod and a giant explosion occurs. The squad decides to camp out and Peeta suddenly arrives. Katniss is on edge. Boggs then brings Katniss aside and tells her about Coin. He tells Katniss that Coin wanted Peeta saved and not her. He tells her to watch out.Night falls as Peeta can't sleep. He and Katniss talk, and they devise a game to help Peeta figure out what is real and what part of him is Capitol programming. As day comes, Finnick helps Peeta as they explore, ready to shoot a propo. A pod of machine guns then appear, but everyone dodges the hail of bullets. As they walk forward, Boggs is suddenly shot along with Leeg 1. Boggs, in his dying breath, gives Katniss full security access to the Holo. He also tells her not to trust them, and for her to kill Peeta if it has to come to it. Leeg 2 then accidentally activates a lever causing a LOT of black ooze running towards the team. Along the way, Peeta's Capitol programming is activated and he tries to kill Katniss with a bow. Mitchell intervenes and in the process, Peeta shoves him in the ooze which causes him to fly up and get impaled by spikes.The surviving members of Squad 451 then runs inside a building. Jackson demands the Holo from Katniss. Katniss lies and says that Boggs gave her clearance and that she is on a mission to kill Snow, on orders of President Coin. Cressida backs up Katniss' story, saying that Plutarch wants the assassination of Snow to be televised, thinking that it would end the war. Jackson doesn't believe Katniss and demands for the Holo to handed over to her. Katniss shows her it's programmed for her, but Jackson still has doubts. A Mexican standoff occurs, but eventually Jackson backs down and allows Katniss to have the Holo. Leeg 2 decides to stay behind with her injured twin as Peacekeeper soldiers arrive and everyone hides in another building. Everyone watches in horror as the Peacekeepers all blow up the building, killing the two Leeg twins.Peeta feels extremely guilty over snapping and killing Mitchell and nearly killing Katniss. Suddenly, a broadcast pops up with Caesar Flickerman (Stanley Tucci) announcing the death of the entire squad as the building blowing up is televised. Snow then pops out and says that he's happy to see Katniss dead and that the rebellion is over. Coin then hijacks the broadcast defending the Mockingjay (Katniss) and that she is still the face of the revolution, even in death.The squad then begins to go to the mansion, but the Holo shows multiple traps on the street. Pollux signs to Castor that they can go down the sanitation system instead. Underground, they hide from the peacekeepers but are seen on the security camera. President Snow with a bleeding nose then sees the security camera footage and is surprised.In the sewage system, after narrowly avoiding a steam pipe burst, the team decides to sleep. Katniss indulges Peeta in more games of 'Real or Not Real' and then Peeta reveals that the Capitol used wasp Tracker Jacker venom in his programming. Katniss promises to keep them alive. Katniss then hears something and the group investigates. Something has been sent after them.After some intense searching (almost like a horror movie), Jackson is trampled to death by some weird lizard creatures. The remaining group fights them off and tries to escape. Castor is trampled and eaten alive by the creatures, and Katniss is nearly killed by one but she and Peeta fight them off. Finnick then uses his trident to fight off the creatures to help the remaining members of the squad. When it's his turn to come up however, the creatures drag him off the ladder and begin eating him. Katniss then throws the Holo in and says "Nightlock" three times to mercy kill him.The surviving group begins to run through a floor which begins to collapse with fire beams. Messala runs into the beam and ends up disintegrating while Peeta activates once again and tries to kill Katniss, but they all eventually run out and go inside a fashion shop owned by Tigres, a former Capitol designer.While hiding underground, Katniss says that her mission was fake and that she caused all those deaths. Cresida tells her that they all knew, even Jackson. Peeta mentions his Capitol programming and tells Katniss to end all of it. He tells her that if Snow dies, all of the deaths will be for something. He tells Katniss to handcuff him to be safe from him.While Katniss tries to sleep, Gale tells Peeta that she loves Peeta more. An emergency broadcast then pops out with President Snow ordering an evacuation of the Capitol - the Rebellion had arrived. As the pods would be deactivated, Katniss decides to walk with the refugees and take down Snow once and for all. Peeta decides to go with her and Katniss uncuffs him.Katniss and Gale, under disguise, march towards Snows mansion. When they see Peacekeeper soldiers checking everyone's faces, they try to go a different route, but end up being forced to follow the crowd. Just as a peacekeeper is about to expose Katniss, a tank explodes - the Rebellion was in the Capitol. Katniss sees the Peacekeepers take Gale who is screaming at her to shoot him with her bow but she doesn't. Katniss runs to the front of the Snow Mansion, where she sees Peacekeepers forcibly taking children from the crowd - as children were the first priority in the evacuation. Parachutes then drop and explode, killing all the children. Katniss falls down from the blast and sees Prim trying to tend to the children. She screams out at Prim only for another batch of bombs to drop and explode, killing Prim and knocking Katniss unconcious.Katniss wakes up inside Snow's mansion and is being tended to by her mother (Paula Malcomson). Haymitch (Woody Harrelson) informs her that the rebellion was successful, and that Coin is now leading them. Katniss finds out that Prim died from her mother's reaction. Later on, when she's in shape again, Gale enters. Katniss blames Gale for Prim's death and says: "Goodbye, Gale".Katniss then goes to the garden where Snow is held captive. Snow tells Katniss that he was not responsible for the parachutes, that it was Coin's plan, as once the blasts ended, everyone had turned against him. Katniss says in disgust, "I don't believe you". Snow then answers: "Oh, my dear Miss Everdeen, I thought we had agreed not to lie to each other. "A meeting then takes place with Coin and the other surviving victors. Coin has turned herself into the interim President of Panem for an indefinite period of time and she has an idea: she wants to have another Hunger Games with Capitol children. Peeta, Annie, and Beetee (Jeffery Wright) are highly against it, but Johanna and two other victors are. It's all up to Katniss and Haymitch. After thinking about it and adding the demand of her being the one to kill Snow, Katniss says 'yes' for Prim. Haymitch says: "I'm with the Mockingjay". Effie Trinket (Elizabeth Banks) then dresses up Katniss for the execution, and Katniss pockets a Nightlock pill.Katniss then marches on her way to execute Snow publicly. President Coin makes a speech and says, "Shoot as clean as your heart is". Katniss thinks about it and aims her arrow at Snow but then suddenly turns her bow away last minute and shoots Coin instead. Coin tumbles dead while President Snow laughs. The livid crowd rushes to the laughing Snow and presumably kills him while Katniss tries to commit suicide by taking the pill. Peeta smacks it away from her hand as Katniss is dragged away.Inside the Capitol, Haymitch reads a letter written for her by Plutarch. Plutarch says that he was happy with what Katniss did, but as people were mad, he would have to acquit her in the future and not now. Plutarch says at the end that: "We may mess up, but perhaps we may learn from our mistakes this time".Katniss then is sent back to her home in the Victors Village at District 12 accompanied by Haymitch. After saying goodbye to Effie, Haymitch tells Effie not to be a stranger then kisses her.Back at 12, when Katniss enters her home, she sees her cat Buttercup. She has an emotional meltdown over Prim, followed by her hugging the cat and crying. She then slowly builds herself up again by hunting. She later finds Peeta planting roses in her garden - Primrose, named after her sister. They hug and then after a montage of them living together, Peeta asks Katniss: "You love me. Real or not real?" Katniss answers: "Real. "In the final scenes, there is a flashforward several years later where Katniss and Peeta are married and have two children. Peeta is playing with the older child while Katniss holds the younger child peacefully. She gives a monologue on how in the future she would be able to tell her children her story, and that nightmares were like a game that was played over and over again, and would feel tedious at times. She then closes the series with the quote: "But there are worse games to play."